The Giro E2 Helmet is a race winners helmet. 24 large Wind Tunnel vents are fully sculpted and channelled inside the helmet forcing cold air in and hot air out. Great on slower sections where the supercharger effect maximises slow air speed for constant ventilation. 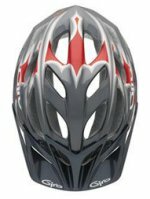 In-Moulded upper and lower hardbody for high strength and maximum protection. RocLoc 4 fits like a glove allowing lateral and vertical adjustment. Coolmax pads add comfort and wick away sweat, and these can be removed for washing if necessary. Patented POV system keeps the visor stable and firmly in position whilst charging through single-track or bad weather - 15 degrees of adjustment for perfect vision and eye protection. Weight: 284 grams. Meets CE EN1078 certification.